The postmodern heir to North By Northwest...like any deathless classic, Raiders is a perfect marriage of star and material. 115 min. Paramount Pictures. Director: Steven Spielberg. Cast: Harrison Ford, Karen Allen, Paul Freeman, Ronald Lacey, John Rhys Davies. It is the rare genre film that achieves a cinematic alchemy of widespread popular and critical appeal, earning the designation of "classic." It is the rarer genre film that achieves this status by purveying pure pop pleasure so self-assured that it bypasses our usual sense and sensibility. To reject these films is a matter of taste, but to nitpick them would be churlish and miss the point of their straight-shot delivery systems. Take North By Northwest: whether it's high art is debatable, but I don't want to meet the person that doesn't agree it's a supreme, transporting entertainment. Its plot is pure, precise, magical misdirection, a a string of setpieces made of comedy, action, and star power; certain narrative transitions don't hold up to scrutiny, but Hitchcock tucks them away and keeps the vehicle moving. Raiders of the Lost Ark is the postmodern heir to North By Northwest. Its screwy plot points are willfully ignored on a first, rapt viewing—applying lessons learned on Jaws, director Steven Spielberg ruthlessly keeps his shark alive by putting the motion in motion picture. Executive producer George Lucas gets the credit for the film's great idea: in 1936, a heroic archaeologist braves dangers to seek out hidden treasures and protect them from hands even less scrupulous than his own. Beyond the notion of the globe-trotting professor-adventure (with an instantly identifiable silhouette superficially patterned after Charlton Heston's adventurer hero in Secret of the Incas), Lucas' concept was to breathe new life into an old theatrical form: the cliffhanger serial, with its roller-coaster structure constantly building to thrilling spills. Lucas shares story credit with Philip Kaufman, with the screenplay credited to Lawrence Kasdan (it's no coincidence that all three are prominent directors in their own rights). Like any deathless classic, Raiders is a perfect marriage of star and material. After the legendary loss of Tom Selleck to his Magnum P.I. contract, Lucas reverted to tried-and-true collaborator Harrison Ford. Ford brings every ounce of his laconic charm and physical style to the role of Indiana Jones, a mousy professor who unleashes his inner hero in lusty pursuit of fortune and glory by way of objets d'art that belong in a museum (and not just any museum—the one run by Denholm Elliot's fussy, trusty Marcus Brody). Jones' Moriarty—the clever rival who plagues him at every turn—is René Belloq (Paul Freeman). Like the best antagonists, the dastardly Frenchman represents Jones' shadow, but pressed to moral crossroads, "Indy" always (if perhaps ruefully) takes the high road. The ultimate prize sought by Jones, Belloq, the U.S. government and the Nazis is the Ark of the Covenant, the golden vessel said to contain the fragments of the stone tablets engraved with the Ten Commandments. Jones' adventure brings him back into contact with old flame Marion Ravenwood (Karen Allen) and old friend Sallah (John Rhys-Davies), who along with Brody become recurring characters in the franchise. Allen acquits herself particularly well, matching Ford step by step through the film's romantic, comedic, and action-oriented demands: a drinker and brawler, Marion is quickly established as no mere damsel in distress (though the pants-wearing progressive is at one point a captive damsel in "dis dress," a flattering white number accessorized by a pit of snakes). Spielberg lends hyper-attentive skill to witty and inventive action sequences, scored to perfection by modern movie-music master John Williams. The chases and brawls (and their attendant stunts, photography, and editing) are the measure of all action films since in their clarity and energy. The film also created a winning formula that lent itself to three sequels: a mission of great import to retrieve an artifact of cultural significance and supernatural power. The journey is all, with Jones proving his mettle, but in the end meeting profound forces with awe and humility. The religious overtones, archetypal play of shadow and light, and brushes with mortality are yet more canny choices on the part of pop masters Spielberg and Lucas. They know filmgoers sit down wanting to get carried away, to invest themselves in a story not only to suspend disbelief, but to believe. Reality can wait for two hours. For the first time on DVD, each of the Indiana Jones films gets an individual special edition, packaged together in the three-disc set Indiana Jones—The Adventure Collection. The Raiders disc kicks off with a Trailer for Indiana Jones and the Kingdom of the Crystal Skull (1:55). A familiar menu points the viewer to a fine anamorphic transfer of the film and a suite of brand-new extras, many of them featuring the cast of "Indy IV." "Raiders of the Lost Ark: An Introduction" (7:48) is a concise an entertaining overview of the salient points about the original film, with comments (filmed separately) by George Lucas and Steven Spielberg. "Indiana Jones: An Appreciation—Indy IV looks back at the Original Trilogy" (11:41) seats the major players of the new sequel to recall their first impressions and favorite moments from the first three films. Participants include Lucas, Spielberg, producer Frank Marshall, executive producer Kathleen Kennedy, Harrison Ford, Karen Allen, screenwriter David Koepp, Ray Winstone, Jim Broadbent, John Hurt, Cate Blanchett, and Shia La Beouf. "Raiders: The Melting Face!" (8:49) is a rather unique featurette that focuses on a single key special effect. To accompany a discussion of the concept and execution of the effect (by Spielberg, special effects makeup man Chris Walas, and visual effects supervisor Richard Edlund), ILM employees stage a modern-day re-creation of it. All of the above are produced by the top talent in DVD extras: Laurent Bouzereau. Also included are "Storyboards: The Well of Souls" (4:17)—which compares, in a top-bottom layout, the concept drawings to the finished sequence—and four Galleries: "Illustrations & Props," "Production Photographs & Portraits," "Effects/ILM," and "Marketing." Lastly, a test of your sense of humor: the Game Trailer (1:19) for Lego Indiana Jones: The Original Adventures. For the details on the other DVD special editions, click the reviews on the right. 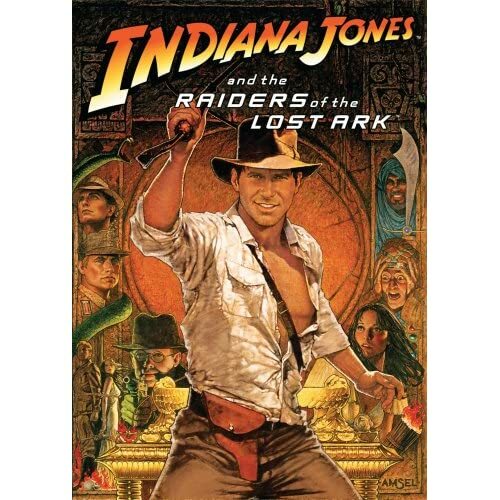 NOTE: The disc of bonus features included with the 2003 set The Adventures of Indiana Jones: The Complete DVD Movie Collection has not been replicated here, so that set (with its terrific feature documentary by Bouzereau and featurettes on the music, sound, special effects, and stunts) has not yet been made obsolete. A Blu-Ray reissue of the trilogy seems inevitable to accompany the already announced Blu-Ray debut of the fourth film. All site content © 2000-2019 Peter Canavese. Page generated at 04/25/2019 03:06:45PM.